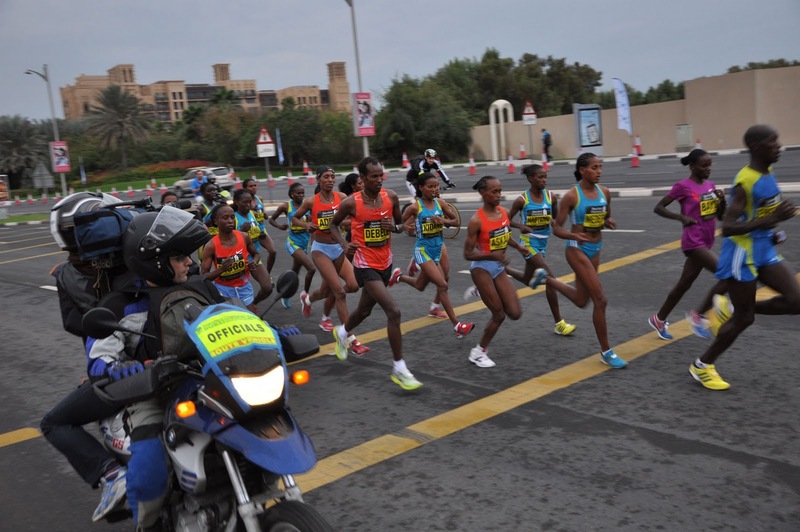 The ladies from Kenya and Ethiopia that ran a little faster than me. So here we go. I am about to run my first ever marathon. I trained hard for it for 3 months. I learned what it feels like to run 29k, 34k, 37k. It has been a time-consuming plan, that had me running 4-5 times per week. It took self-discipline. It took pain. I learned to deal with pains in my body. I learned how much time I needed to recover from it. The training already provided a sense of achievement: I noticed that my body would recover faster. I would consider long distances as not so long anymore because I ran them so frequently. 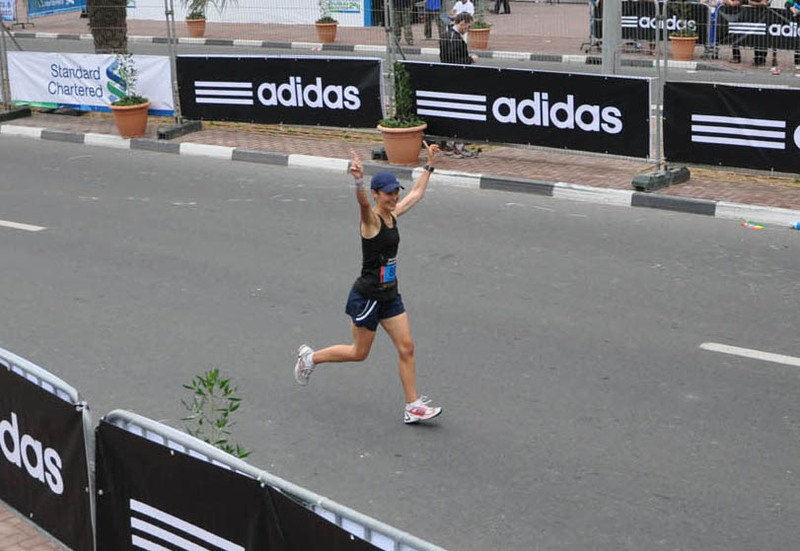 The biggest revelation/relief was that I wasn't scared of the long runs: if 34k or 37k were on the schedule, I'd plan them carefully and just run them, expecting all the pains during and after the race as part of the deal. I learned at which paces I'd be comfortable for a long time. Everything was done as best as I could. Race day was approaching. Three days before race day I did my last training run, a slow 6k run. I felt fine. 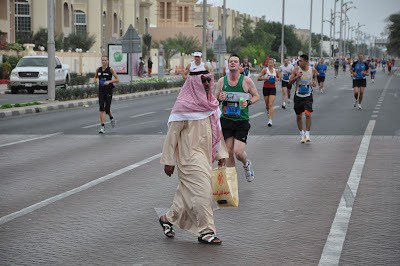 Two days before the marathon, my stomach got upset. It was paining to an extent that I wasn't sure if I could be running at all. I didn't know if it was a bug or my nervousness kicking in, as I thought I felt pretty cool about the race. I knew I was well prepared and ready for it. In the night before the race I woke up at 2am, realizing that the tummy pain was gone. That got me so overtly happy, relieved and excited that I was hardly able to sleep until the alarm went off at 4.45am. Up I got to chomp down a bowl of porridge with mashed banana at 5am, two hours before the race would start. Not a meal that I really enjoyed, as it was far too early. But I can eat if I think I have too. That also helped me during the race. More about that later. I arrived early at the starting area. It was overcast and raining. Two very rare weather situations in Dubai. I didn't mind the clouds. But I didn't really want to run in the rain for 4 hours. 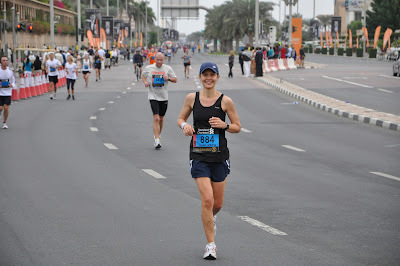 By the time the race went off, the rain had stopped and it remained overcast which provided perfect weather conditions: a steady 20C throughout my whole race. 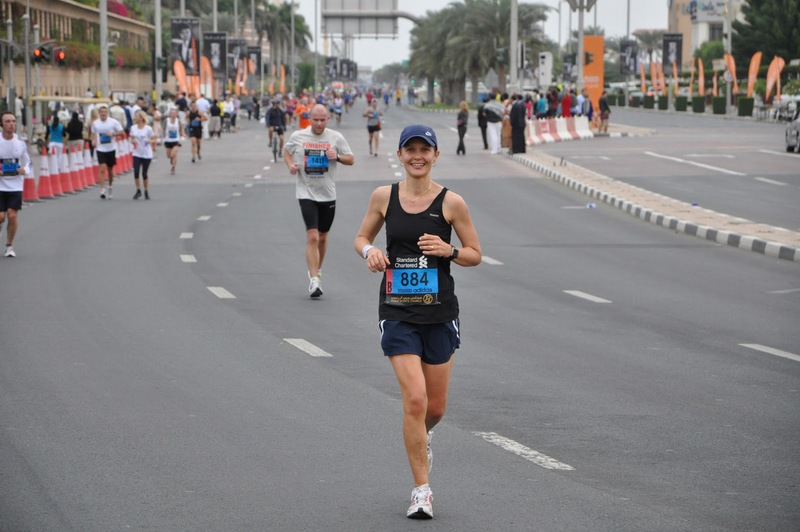 The Dubai marathon is rather small. I think less than 1,500 people were at the starting line. I started off on a pace that would bring me home in 4 hours. This pace felt comfortable, although it took some braveness from my side to stick to it, as friends of mine went off with a slightly faster pace that I thought I wouldn't be able to keep up with for the whole distance. I let them go with a heavy heart. Marathon? What marathon? Life goes on as usual for other people. My only comfort was that I would still be home in 4 hours which was my primary goal time. I positioned my husband and sister at agreed spots along the route (approx. every 6-8km) to provide me with my "doping" (just my preferred sports drink and half bananas). 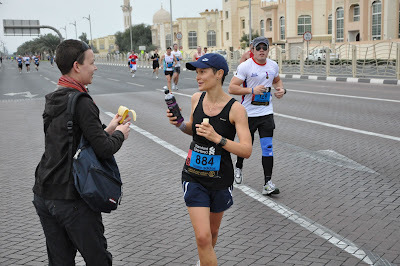 My sister providing me with bananas and sport drinks at 13k. That cut up the whole distance into more foreseeable "laps". I would only think of the distance to run until I would see them again. I felt good at halfway point. From the 25k mark on, more and more people were walking, stretching their calves at lamp posts, looking not their freshest. It motivated me overtaking them all while still feeling good and still running a pace that would result in a 4h finish time. That doesn't mean that I wasn't sore: I could feel my bones, especially in the hip area hurting, at that time. However, during my training runs I learned how to run with these pains, accepting them as part of the package. Somewhere between 30k and 33k I overtook my friends that had started off faster than me. I still felt strong. I saw my husband and my sister at the 35k mark for the last piece of banana. Pretend to be fresh as a daisy at 35k. Almost home!!! I suddenly realized, I'd only see them again after completing my first full marathon. 42k, 4 hours of non-stop running. An emotional thought that actually brought tears to my eyes. I sprinted (as much as you can do that after 3 1/2 hours of running) towards the finish area. And overtook people up until the last meters. On the grandstand I heard another friend of mine shouting my name. What a good feeling when people and especially friends come to see you finish. 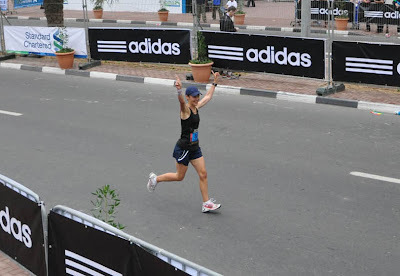 My husband took pictures of me crossing the finish line. I fulfilled a big dream: completing a full marathon, and finishing my first one in less than 4 hours (exact time was 3h 58min 01sec with split times of 1h59min for first and 1h 58min for the second half). 20 meters to go and realizing I did in under 4 hours. As I am writing this, about 36 hours later, I must say that the sense of achievement is still sinking in. I am feeling great, I know I have achieved something really extraordinary. I am very proud that I trusted my instincts about how to run this race. It all paid off in the end. And it hooked me on. I will definitely do another marathon. Or two, or three. Or many, many, many!